This is a term I use myself sometimes to denote a dislike of something so intense that it borders on irrationality and can interfere with judgment. I'll explain in a bit what a Volkswagen has to do with it. First, let's think back to March 10th, 2003. Yes, just ten days before the Iraq War began, the largest strategic blunder the US has made in decades. It was a time when the Bush administration was preparing for a war they had decided to embark upon long before that, and the public was debating over whether this was a good idea or not. There was 64% approval for military action against Iraq, though 63% wanted the president to find a diplomatic solution instead if possible, and 62% believed the threat of terrorism would increase if a war were to start. All in all, a fairly divided populace. And though the Bush administration had already made the decision to go to war, the media at the time was especially lax regarding the claims regarding WMD, Al-Qaeda connections and the rest. Many countries in Europe though, especially the Vatican, were strongly opposed. Cardinal Solano, secretary of state to the Vatican, who recently bleated: "We want to say to America: Is it worth it to you? Won't you have, afterwards, decades of hostility in the Islamic world?" This solicitude for the feelings of pro-Saddam Muslims—of whom the leading faction is constituted by al-Qaida—is new for Holy Mother Church. After a bit more ranting on this subject he then turns on Jimmy Carter for his opposition, including calling him a "Baptist big mouth". You can read the article for yourself so I don't need to go into any detail, but suffice to say it's about as relevant a criticism as calling out Bill Clinton for something he did in 2009 by referencing his incident with Monica Lewinsky. The issue at the moment was whether it was right to invade Iraq, and Hitchens' op-ed that day was an utter failure. There's a saying whenever one finds oneself agreeing with one's enemy every once in a blue moon - even a broken clock is right twice a day. That is, even those that are in complete disagreement with you / always wrong can still be right every once in a while. Being able to recognize when one's opponent is right is extremely important, as a knee-jerk opposition to everything one's opponent does is simply too simple a philosophy to be valid. Even if we were to assume the very worst about the Catholic Church and attribute every single criticism its opponents make to it (anti-science, anti-progress, peddling dangerous superstition, fans of child molestation, you name it), the fact is that the Vatican was right on the Iraq War. Of course, a more consistently anti-religious person would have seen the war as being supported by a large number from one sect of a religion (Protestants/Evangelicals), opposed by another (European Catholics in particular), and waged on another group of religious people (Muslims), so the "atheists are right and theists are wrong" argument doesn't even apply here. But I digress. Back to the subject: my personal term for this is missing the Volkswagen. 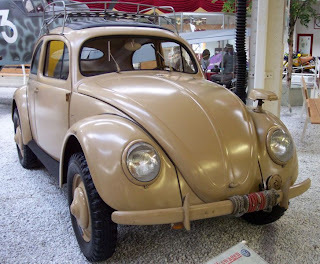 Seeing the Volkswagen would be a recognition that one's opponent can be right from time to time or in some areas. That's a reference to Nazi Germany, which committed some of the worst atrocities in history, but after its defeat at least nobody tried to make the argument that the Volkswagen factories needed to be destroyed along with it, or the Autobahn, or anything else the Nazis happened to do well, just because of who made them. I'm certain that there's a better / more official way to express this (note to self: check this list), but because I've never bothered to look it up, missing the Volkswagen has always been my preferred term. Edit: an association fallacy is pretty close to this term. It reminds me when a Portuguese woman argued that it was my fault too that Brazil has a lot of important structural problems that do not exist (or exist in a softer way) in Western European countries. According to her, I am responsible for that because I happen to be a Brazilian, and Brazilians have caused this problem. In other words, just because I happened to be born in Brazil, I am one of the bad guys. Xenophoby is in my opinion the apotheotic example of the Association Fallacy.